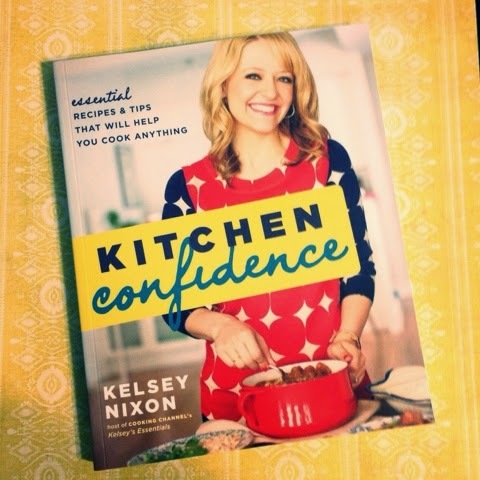 To kick off my May learning Kelsey Nixon's Kitchen Confidence, I couldn't have picked a better recipe, the Charred Corn Salad. Wow, it had everything going for it: amazingly tasty, easy enough for a weeknight, not too many ingredients, super-fresh flavors and it got us excited for Summer. Which lets face it, for those of us in Texas, is already here. First, let's talk about this simple but delicious ingredient list. Corn, red onion, heirloom tomatoes. Yeah, that's it other than fresh basil & a few other basics I can almost guarantee you have sitting in your pantry right now. Nothing fancy or expensive. In fact, these fresh goodies were on-sale for very cheap when I made this week's trip to the grocery store. 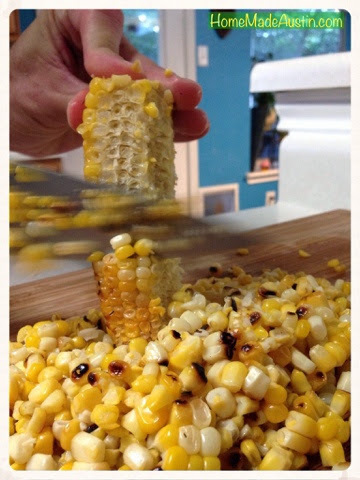 Now, for a shot of the grilled corn being taken off the cob by Andrew. Do you see that beautiful color & carmalization? Drool. And the fragrant, basil vinegrette that pulls this whole salad together? Perfect. It's not too sweet, not too pungent, just, perfect. And a breeze to make. 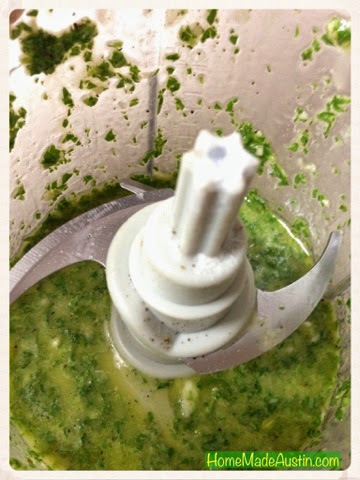 I threw everything in my ninja for a few seconds & ended up with this pretty little sauce. 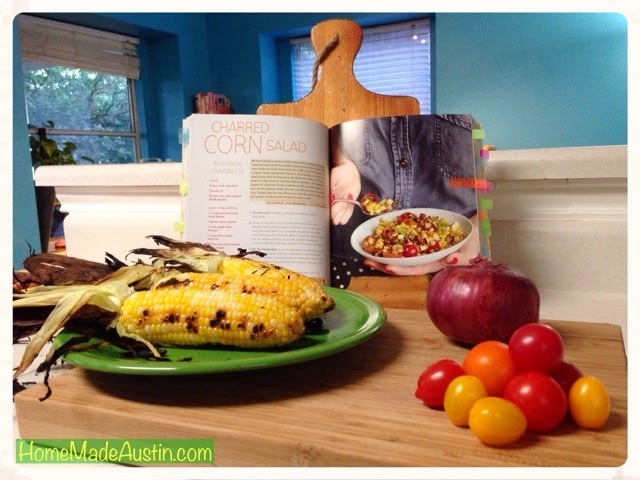 I'm really thrilled with how much Andrew & I both loved this Charred Corn Salad. I even ate all of the red onion & tomato in my serving, which if you know me is saying a lot. 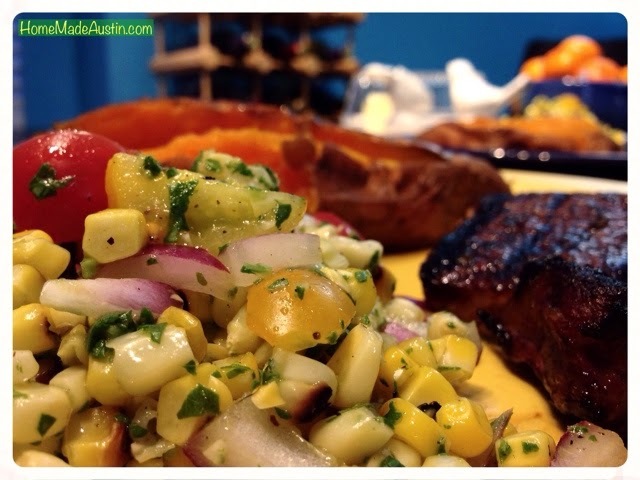 I am not a huge fan of raw tomato or onion, but with the combo of the sweet charred corn & the bright vinegrette there was no 'bite' from the red onion to worry about or mushy tomato to deal with. It was Summer in a bowl. We are already talking about making this again next week & throughout the rest of the season. I think it would be a stunner for dinner parties, BBQs or potlucks. 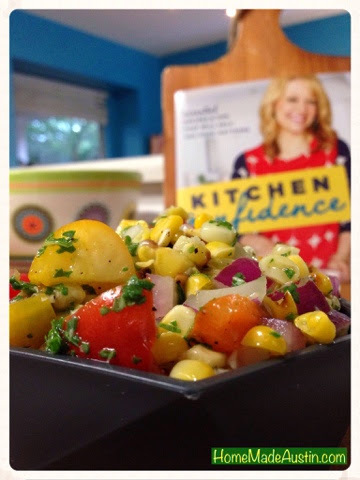 Kelsey Nixon's Charred Corn Salad was such a hit, I can't wait to try another dish from Kitchen Confidence & tell you all about it!